Any board orders for the Lower 48 States will be shipped for Free! No codes or coupons needed, it's automatic! Most shipments should arrive in 2-5 business days. We make our boards and our rocks out of sustainably harvested wood in the USA. A lot of care an attention goes into each one and we know you'll have it for a long time. Learn how the Zippy could be the perfect board for you! 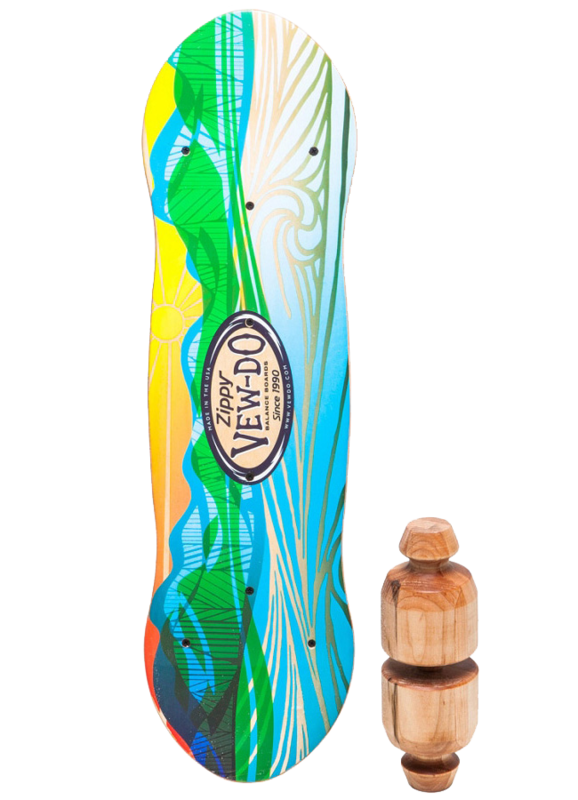 The Zippy features a non-toxic, anti-slip STS riding surface and a 6 ply sustainable 100% North American maple deck. The rock has a 19 degree outrigger training system providing extra stability for the rider making it a perfect fit for beginners and intermediate riders alike. The 2017 Zippy is the original Vew-Do Balance Board. Still true to the traditional style, the Zippy is a versatile board that can provide beneficial balance training and fun for anyone in the family. Maintaining our signature 360 degree mobility, it provides greater stability using a rock designed with outriggers that act as a balance guide. Although the decks are shaped differently both the Flow and Zippy decks have the same overall running length and are similar in performance. The most significant difference in performance is designed around the Rocks (or rollers). The longer Zippy rock is machined with our patented outrigger design which act as "training wheels" when a rider applies toe or heal pressure to the board. The outriggers allow for increased stability when performing maneuvers requiring toe and heal pressure such as turning spinning and tilting. It's the outrigger design that makes the Zippy ideal for beginner to intermediate riders. Conversely the outrigger-less design of the Flow rock allows the rider to achieve greater toe and heal performance at higher angles thereby making the Flow more challenging and performance driven. The Flow is ideal for intermediate to advanced riders. The new 2017 Zippy is a traditional style balance board addressing the balance training needs of the entire family. With its outrigger rock design, riders can experience reduced, toe to heal transitions thereby making The Zippy ideal for beginner to intermediate riders of all ages. Curious about the Zippy rock and accessories that could come with your new board? Q: can I ask a test question?